Sat, Jan 19, 2019, 01:35 pm SL Time, ColomboPage News Desk, Sri Lanka. 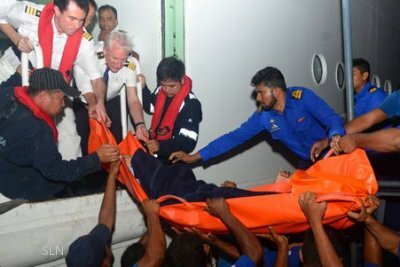 Jan 19, Colombo: Sri Lanka Navy has rendered assistance to transfer a foreign patient onboard a cruise ship to a hospital in the Sri Lankan capital. The Maritime Rescue Coordinating Centre (MRCC) established at Naval Headquarters in Colombo has received the information about a sick passenger onboard the German Cruise ship 'Amadea' which was heading to Hambanthota port from Cochin port India. Upon receiving the information, Sri Lanka Navy has promptly dispatched a Fast Attack Craft attached to the Western Naval Command to the location of the cruise ship to get the patient aboard the naval craft. The naval personnel reached the vessel in the seas about 18 nautical miles South of Colombo Lighthouse and safely transferred the patient to the Colombo harbor premises. The patient was then admitted to the Colombo Nawaloka hospital for medical treatment.